As the floods raged across the north-east, one of the area?s biggest concerns surrounded the future of Abergeldie Castle, with fears that the rising River Dee could wash away the building which has stood strong since the 16th century. The Queen?s neighbour at Balmoral, John Gordon, had to flee the castle as the raging River Dee swept away trees and a huge chunk of land at the rear of his ancient Abergeldie Castle. When Mr Gordon looked out of his back door he saw just 5ft of dry land between him and the fearsome flood ? where before there has been 60ft of ground stretching out to the to the river bank. This does beg the question why the rock embankment wasn't installed previously to prevent the washout and undercut of the riverbank. Article doesn't write about how this emergency construction was arranged and funded. On April 29 2015, the 8th Earl of Onslow stood in front of his former family pile, Clandon Park in Surrey, as it burned. The blaze destroyed 95 per cent of the 38,000 sq ft Palladian mansion. Now, nine months later, the National Trust has unveiled its plans to part-restore the property - which was donated to the Trust in 1956 - much to Lord Onslow's dismay. The earl told the Daily Telegraph that the organisation should use the Clandon insurance money to save Wentworth Woodhouse instead, the likely inspiration for Jane Austen?s Pemberley (Pride & Prejudice). The sale of the Grade I listed Wentworth, the largest privately owned house in Europe, built between 1724 and 1750, was agreed with a Hong Kong fund in December but shortly afterwards the BP8 million deal fell through. For Lord Onslow, the 300-room mansion near Rotherham should be restored by the National Trust as a British tourist attraction, enterprise hub and form part of George Osborne's Northern Powerhouse. Of course, Wentworth needs work: subsidence issues require addressing, and there's the problem of how to manage, and make the best of, such a large house. ''It could have multiple-occupancy, and be part of Sheffield University, with incubation space for start-up businesses, as well as for those that are already established,'' he says. He also recommends that Wentworth copy Stowe, the National Trust property in Buckinghamshire. The building houses a school and the public pay to visit the park. ''Why should only schools like Eton and Harrow have access to these beautiful buildings'' he asks. However, there is the not-so-small matter of the insurance payout - which is estimated to be around BP65 million. Dame Helen Ghosh, the director-general of the National Trust, and former permanent secretary to the Home Office, claims that the underwriters for Clandon won't cover an alternative purchase, and that Lord Onslow's suggestion is ''based on a misunderstanding''. The insurance money cannot be used elsewhere because Clandon is ''inalienable'' - meaning the property can never be sold or mortgaged - she explains. But Lord Onslow, an insurance underwriter by profession, believes that an organisation as well-connected as the Trust could come to an agreement with the lender. The insurance company, Zurich, is sitting on the fence. ''We have been flexible in accommodating the needs of the National Trust, as the final decision about the future of Clandon rests on them,'' a spokesman comments. It is the insurance money that will fund the Trust's partial reconstruction of Clandon. On Monday Dame Helen unveiled detailed plans to painstakingly restore the great Marble Hall, with its double-height ceiling, and the Speakers' Parlour, to their 18th-century state. ''We want to tell the story of the architecture,'' she says. The Trust also plans to build a modern exhibition space upstairs, and will run a competition to find the right architect for the high profile and challenging job. The ruin that was Clandon is the result of an electrical fault in the distribution board. The fire swept through the building with unusual speed and ferocity due to high winds that day, and a disused lift shaft which acted as a wind tunnel fanning the flames. Even with 16 fire crews put to work, an estimated 90 per cent of the contents was lost, although volunteers were able to save some 400 items most precious items using what the Trust calls the ''starred list''. By lucky coincidence this drill had been rehearsed just weeks earlier in a full-scale disaster practise. While Dame Helen described the fire as the opportunity for a new start, the earl views it as a chance for the Trust to reassess its goals. ''This isn't about me. It is even less about Clandon. It's about the National Trust and what they are going to do next,'' says Lord Onslow. ''It is the membership whose voice should be heard. Is this what is best for them''. 360-degree virtual tour of some of Buck Palace's State Rooms. Amazeballs. Using this topic because the building is used for the coronation. I was comparing this map with other maps of London to see what had changed and what may be the same. Reading this map I found a church titled 'St Peter's Cathedral'. Here's the map. Look on the upper right side next to a space labeled 'The Sanctuary'. You can pull up a Google map and find the current area in London and the church is labelled Westminster Abbey. I was surprised and a little confused by the name on the 1682 map. ''On 16 January 1540 monastic life at Westminster came to an end when Henry VIII dissolved the monastery and the deed of surrender was signed. Many of the monks retired or went into "civilian" life. However, the Abbot became the first Dean of the new Cathedral Church founded by Henry and the Prior and several monks became clergy in the new church. A bishop was appointed to the new see of Westminster but after ten short years the bishopric was surrendered and the Church became a Cathedral within the diocese of London. The monks, however, were destined to return just for a short time when Queen Mary I, a Roman Catholic, restored the Benedictine Abbey under Abbot Feckenham in 1556. London has St Paul's Cathedral and St Peter's Cathedral. Evidently St Peter's Cathedral is the correct title for the building. When did 'St Peter's Cathedral' become known as 'Westminster Abbey' ? Can any history buffs enlighten me? 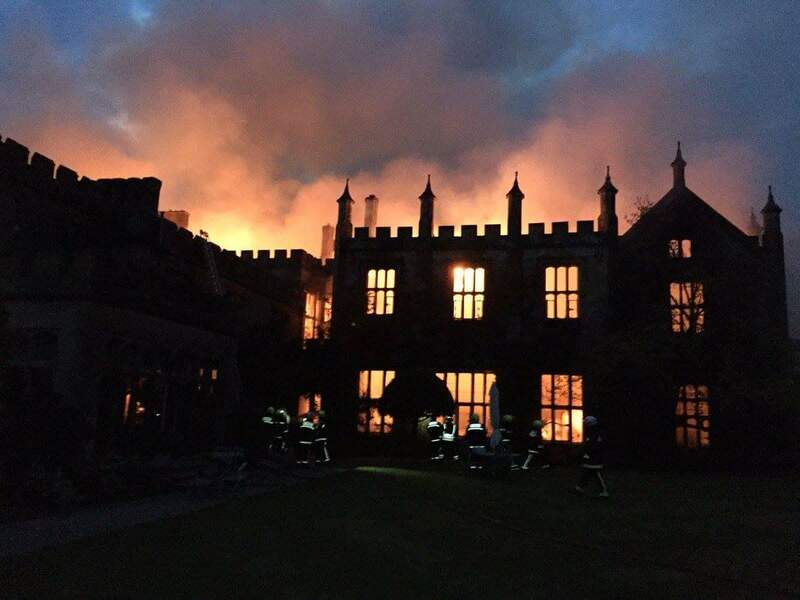 A 16th century mansion remodeled by a Regency architect John Nash has been destroyed by fire after a suspected arson attack. Parnham House, a Grade I listed property in Beaminster, Dorset, was home to the Strode family for 200 years. During the Civil War, the widow of Sir John Strode, Lady Ann Strode, was killed by a Parliamentary soldier as she tried to protect Parnham. Sir John, a lawyer by profession, became a Recorder for Bridport in 1614 and MP for the borough in 1621 and 1625. Much of the current design of the property was created by Nash, who worked on the 19th Century enlargement of Buckingham Palace, in 1810. His work on the stately home, which sits on grounds that include stone statues and topiary, can be recognised in the distinctive winding staircases and stone mullioned windows. The mansion...was engulfed by flames in the early hours of Saturday morning. Twenty fire crews attended the blaze amid fears valuable 18th and 19th century paintings could have been destroyed or damaged. Dorset Police said no one was injured in the blaze, which the force is treating as suspicious. Photographer Graham Hunt, who witnessed the fire, said: "From what I could tell it looks like the roof is just completely gone, just the walls left standing." Have their been any repairs to the gardens at Birkhall since they were destroyed by floods last year? Chatsworth is on my bucket list. Maybe I can bump into Mr Darcy. Chatsworth is amazing. Also Longleat and Knole. Wonderful gardens at Hampton Court. From the link below, it seems that it was informally called the "west minster" to distinguish it from St Pauls, which was the "east minster". Eltham Palace in Greenwich is well worth a visit. It's been around since at least 1305, and its gardens are lovely. It was rebuilt in the 1930s and has gorgeous Art Deco interiors in addition to the ancient Great Hall. Inveraray Castle is near Inveraray in the county of Argyll in Scotland. It is the ancestral home of the Duke of Argyll. Thornbury Castle is in Thornbury in South Gloucestershire in England. King Henry VIII's daughter, Princess Mary, later Queen Mary I, lived here for several years.